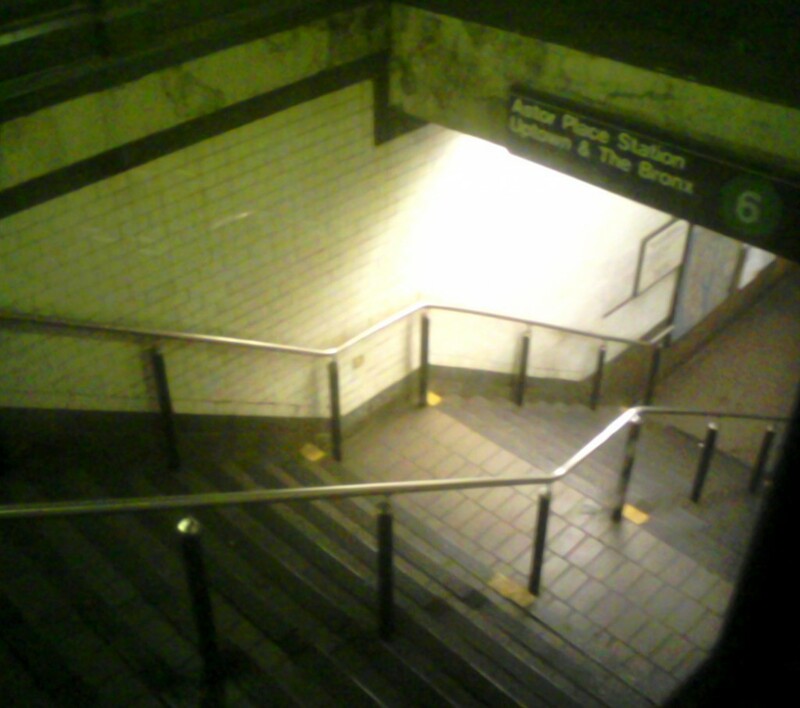 While running down a flight of stairs trying to catch a train, I was recently made aware of a phenomenon that prevents many of us from reaching our potential. At the top of the stairs I could not run quickly, not because it was crowded, but because my body was afraid of mis-stepping. When your body senses the risk of danger to be higher, skills that would normally be performed with no hesitation will suddenly cause nervousness. This is essentially why a fear of heights can be paralyzing for some. If you’ve ever stood on the balcony of a tall building with a relatively low railing, you might have felt tentative approaching the edge. While you would never worry about falling over a low fence that was on level ground, as soon as that same scenario is 20 or 50 feet in the air, your perspective can change. This fear of heights is likely an evolutionary defense mechanism built into humans to prevent us from falling, but since childhood, most of us have also been told by parents and teachers not to jump, climb or hang from things that are high up, so it’s hard to determine where to draw the line between intuition and conditioned behavior. Whatever the reason for it, our fear holds us back more than it helps us. I’m not saying to disregard what your intuition is telling you, but rather to gradually push the limits back. To reprogram yourself to move beyond this performance inhibiting behavior, you must start slowly. 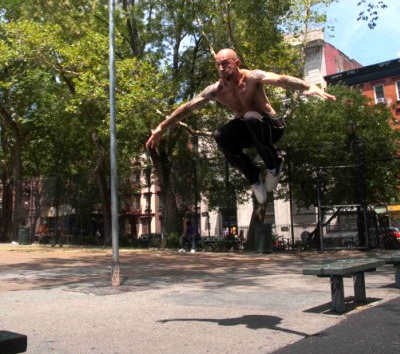 Go to a park and try doing a precision jump on ground level. Just a long jump with both feet taking off together and landing together. No running start. Now count how many feet you jumped. The next step is to find two sturdy, elevated objects several feet from the ground that are closer together than the distance you just jumped. Since you know that you can cover this distance (you just did a longer jump on the ground! ), you should be able to quiet that fear enough to give it a shot. Once you get comfortable with that, find a place to practice jumping a slightly longer distance. In time, you’ll be able to jump just as far while up high as you can on the ground, maybe even farther! I also suggest experimenting with other parkour moves, like vaults to help you overcome your fears. Climbing a tree is another great way to build confidence. Continue to push back your perceived limitations with consistent practice and in time, you’ll eventually be able to shut out fear and replace it with courage. You might even find that confidence sneaking into other aspects of your life. Seeing someone else do it first definitely helps! And yes, John, you can do just about anything you set your mind to! Who better? So true even for more nebulous ideas. This, this right here is what it means to do Parkour, overcoming fear, not just physical obstacles but mental ones as well. Even though I’ve been doing Parkour for over 2 and a half years now there’s not a moment that goes by where I’m not assessing my boundaries and working on ways to stretch them in order to reach a new level of awareness of my body. Thanks, Matt! Keep training hard – the only limitations are the ones we impose on ourselves. Cool~ how fun! There is a rainforest track locals use for workouts, I bounce down the stairs (about 25m) like a gummy bear~ rush. Mmmm…those gummy bears sound tempting! I’ve been thinking about fear lately, too — but from a different angle. I think many people don’t start on an intense fitness routing and/or paleo diet because they’re intimidated by the high level of discipline and commitment exemplified by a lot of us bloggers. We see ourselves as imperfect, of course, but they see us as paragons with which they could never compare. I think it’s important to convey (as you’ve done in your post) that perfection isn’t necessary to garner fantastic results. Good point, Barbey Girl. Nice blog, too!